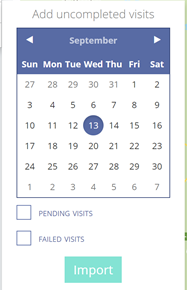 If you need to add pending or failed visits from previous days to you new routes, you can do it in the second step "Visits". You just have to click on Add visits and Not completed. Click on the date you need to add your visits from. Select "Pending visits" and/or "Failed visits". Click on Import. The visits will appear automatically on the list.